don't use sandpaper to clean points. Use a steel points file or steel nailfile. Sandpaper causes premature pitting in points. Borrow a tach/dwell meter and vacuum gauge and timing light. Change out condenser in distributor. I would imagine it needs new plug wires as well. I for one like points ignition. Set timing, then set points with dwell meter. Adjust carb with vacuum gauge attached. Simple once you do it a few times. It can be tractor timed too. Holley's new Dominator EFI can solve all those problems and "learn" what yer little 4 banger wants plus you get instant starts. Got tune up parts parts coming. 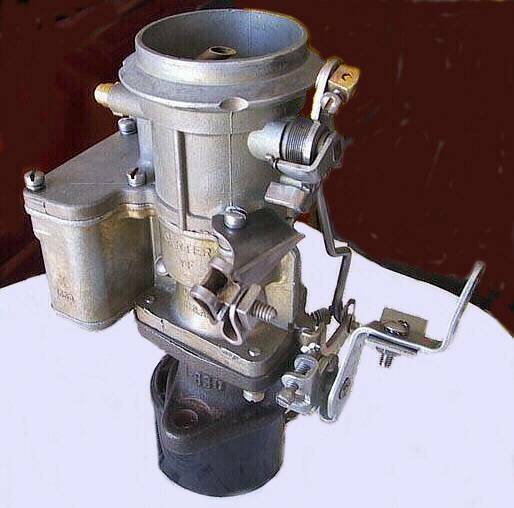 I'll have to take the carburetor apart and take measurements. Someone ground the Part number off it. It'll be a while before I can get back to it. Kinda looks like this Carter. Similar. It's a later model Carter YF. Looks more like a YFA, but without the bowl vent stuff or electric choke.